The Murray Ice Cream Festival is back! We are proud to again feature Kroger Brand Ice Cream, including their Private Selection premium flavors! The fun starts Friday, September 7th, and continues Saturday, September 8th on the Court Square in Murray. 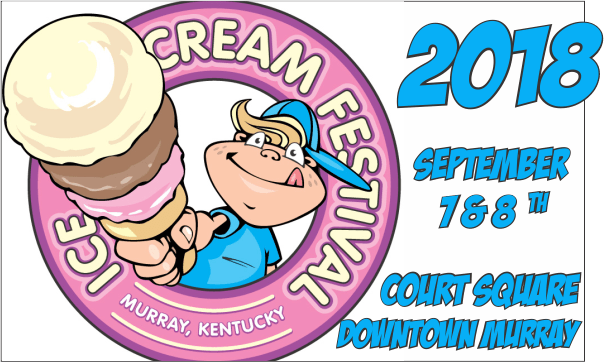 Scroll down to see what’s new at the 2018 Murray Ice Cream Festival, sponsored by Kopperrud Realty, The Gold Rush Jewelers, Cricket Wireless, Kroger Brand Ice Cream, Murray Main Street, WKYQ, Electric 96.9, and 94.7 The Mix. Grand Prize – Kroger Brand Ice Cream for a year! Unlimited play wristbands will be available for in advance at our live Ice Cream Remotes and the Murray Convention and Visitors Bureau. Wristbands made also be purchased the day of the event for $10.